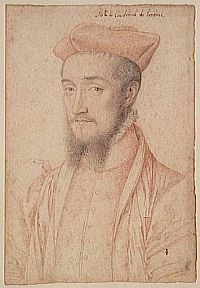 Son of Guilaume Colin, councilor at the présidial in Reims, Nicolas Colin entered into the service of Charles de Lorraine-Guise, cardinal of Lorraine and archbishop of Reims. In 1557 he was canon of the cathedral, in 1570, secretary of the chapter. He accompanied the cardinal to the Council of Trent as secretary and interpreter. Given his perfect mastery of both Italian and Spanish, he organized – within the framework of the literary circle which gathered around the Guises – a number of translations of the works of Louis de Grenade (La Cathechisme, 1587; La Guide des Pêcheurs, 1583; Le Mémorial de la Vie dévote, 1587) and of collections of moral exhortation, contributing to the spread of Tridentine spirituality. But he also organized a version of the Sept livres de Diane by Jorge de Montemayor (1578), as well as a lost version of the Pastor fido by Guarini. He possessed a remarkable library, with a number of modern books, Italian texts (more than 12% of the total) and philosophical and literary works. Bibliography: M. Prévost, Colin (Nicolas), in M. Prévost, Roman d'Amat, et H. Thibout de Morembert, Dictionnaire de biographie française, Paris, Librairie Letouzey et Ané 1961, tome IXe, col. 240; J. Balsamo, Cultures italiennes dans la France du XVIe siècle: quelques médiations rémoises, «Travaux de l'Académie nationale de Reims», vol. CLXV, 1986, pp. 21-39. H. Jadart, Nicolas Colin. Sa vie, son œuvre et sa bibliothèque, «Revue de Champagne et de Brie», Arcis-sur-Aube, t. IV, XVII (1892), IIe sér., pp. 313-349, 431-442.